It seems as though where you live in the world can make a difference as to what mobile applications people favour. This could be due to where they were created, where they are available or sometimes they are tailored towards a particular country. 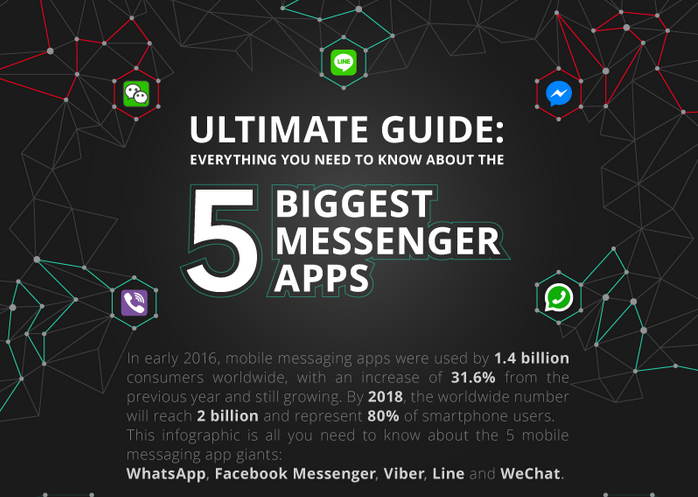 What is surprising is that in almost every single country over the globe, some form of messaging app is the most used type of app. WhatsApp is the world’s current leader, claiming dominance in over 180 countries. This global use allows for its users to speak to people all over the world free, and this could help with its popularity. Some of its countries include the likes of Brazil, Mexico, India, plus many countries in Europe, Asia and Africa. Coming in second place is Facebook’s messenger app, claiming to be the most popular in almost 50 countries around the world including Australia, the US and Canada. Although not known to some people, Viber is another very successful messaging app, coming in third place with the only other app to be a favorite in over 10 countries overall. It seems to be showing a lot of promise within countries in Eastern Europe. Line and WeChat are also popular messaging apps, and claim popularity in multiple countries such as China, Iran and Japan. They have a huge usage in these countries, for example those who live in Japan are likely to have an obsession with Line, and in a recent study have found to use it on average of 40 minutes every single day. It seems as though in Asia, people prefer apps that can help you out in day-to-day life, rather than just being able to send a message. Therefore apps like Line and WeChat that have additional features added in, such as being able to book a cab, shop online and even play games are popular. WeChat is considered the gateway to all services in the country as it has grown to encompass everything. The key to this success is due to the country’s payment systems, as everyone using the apps has a payment methods linked to the app. So far this service has had limited success outside of Asia. Indonesians are some of the most active message app users in the world. On average each Indonesian has 4.2 messaging apps installed onto their mobile devices and they play are large part in their everyday behavior with a huge 97% of users using these apps multiple times during the day. The opportunity for these apps is immense, and the winners of the popularity game will be those that take the opportunity while it is presenting itself. Will the Asian way of using these messaging apps make its way across the world in the near future? Or is it simply the case that some parts of the world like to use the messaging apps for just that, messaging.